Our fat provides more than just insulation and energy storage. It’s actually an organ that plays an essential role in our body’s functioning. Body fat, also known as adipose tissue, needn’t be seen as our number one enemy. While carrying too much fat is linked to a long list of serious health conditions, including heart disease, diabetes, and various cancers, fat is critical to our survival. Fat cushions vital organs, insulates our bodies from the cold, and serves as our fuel storage tank, keeping our demanding metabolic system operating. To learn more about this misunderstood organ (yes, fat is an organ! ), we checked in with Cecile Vernochet, a senior principal scientist in Pfizer’s Cardiovascular and Metabolic Diseases research unit in Kendall Square, Cambridge, who has spent her career studying fat and how it operates in the body. Vernochet focuses on exploring treatments for metabolic diseases that stem from excess fat. 1. 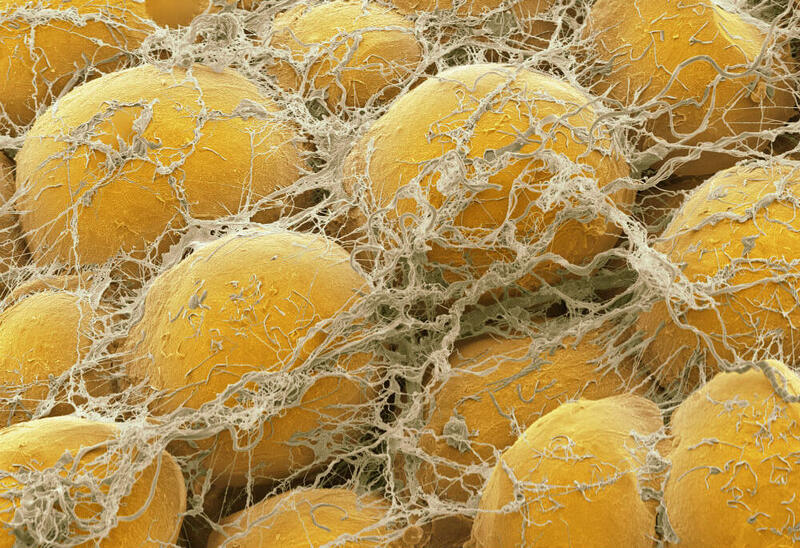 Fat cells are like super-durable balloons. 2. Fat is an organ. Fat plays such an active role in our body’s functioning that it’s considered an organ, not just passive tissue. As an endocrine organ, it secretes two of the major hormones found in people, said Vernochet. Among these are leptin, which controls appetite, and adiponectin, which is connected to blood sugar levels. 3. We have two different kinds of fat. White adipose tissue is our main storehouse of energy that keeps humans from starving and our bodies from shutting down. Only about seven years ago did scientists discover that human adults also have small amounts of brown fat, a type of fat that burns energy rather than stores it. Brown fat, which gets its hue from mitochondria and iron, creates heat when activated under cold conditions. Animals such as bears and rodents rely on brown fat to create heat during hibernation. But scientists wondered why human adults, who had clothing to keep them warm, would need to retain these cellular space heaters? Found in the back of the neck, vertebrae and heart, brown fat might have a protective mechanism, according to Vernochet. Most adults only have 50 grams (less than two ounces) of this energy-burning brown fat, she added. All fat is not created equal. Subcutaneous fat, the kind that sits directly under our skin, is not necessarily harmful to our health. Visceral fat, on the other hand, which is stored in the abdominal cavity and wraps around our organs, is linked to metabolic disease. As people become more obese in the midsection, their fat cells enlarge, leaking toxic fatty acids into the portal vein, which causes fat accumulation in the liver and muscles. If too much fat builds up in the liver, people can also develop non-alcoholic fatty liver disease. Excess belly fat also creates inflammation that can increase susceptibility to certain cancers. 5. Fat fuels our brain during sleep. When we sleep, our body turns to adipose tissue for energy to maintain brain and all other organ functioning. While it’s a small amount of energy compared to the quantity needed during the day when we’re active, having this backup energy storage is a matter of life and death, said Vernochet.